In the last years aluminium railings almost have replaced the old metal railings. They are beautiful outside, corrosion resistant, easy to be assembled because of the ready elements used and last but not least, their modern design gives comfort. They are suitable for houses, villas, offices and administrative buildings. 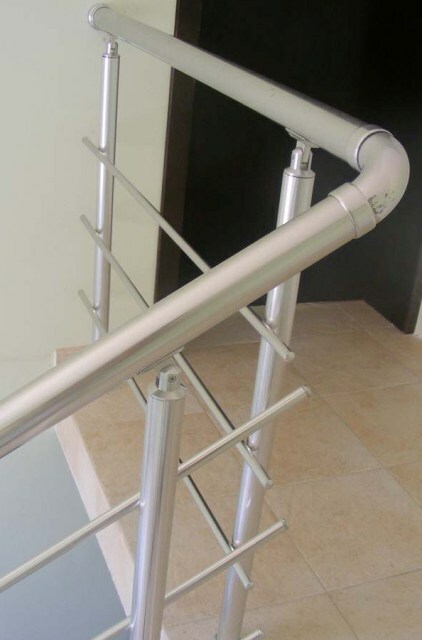 Tubular – with this kind of railing is used handle from 50 mm tube and decorative tubes 16 mm. That type of railings is used mainly for stairs and staircases and could be used for securing lower windows. Glass – triplex is used as a fill in that type of railing /two glasses agglutinated with special colourless resin/, the total thickness of glass is 8 mm. There is possibility for use of colour and reflective glasses.